D Plumridge Professional Driveway and Patio Construction were approached to rejuvenate a tired and untidy looking driveway that had seen better days, and was at risk of getting overgrown by nearby shrubs and planting. 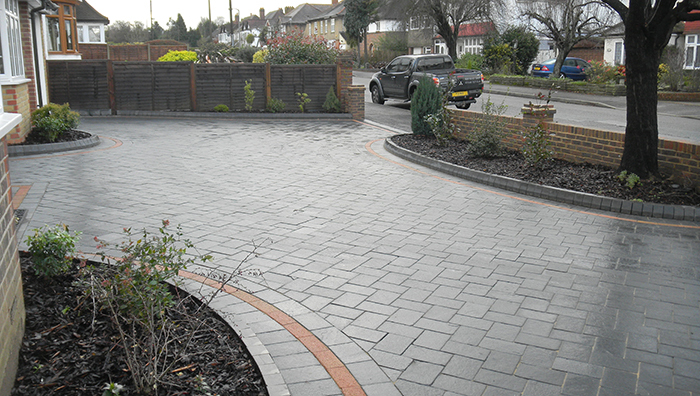 It was important to retain the overall shape of the driveway, while modernising. The client was looking for something that would bring the driveway up to date, create an inviting and neat modern look, while adding some additional parking and clearly delineating the beds and planting. The drive had to blend seamlessly with the rest of the property. The design added vital inches to the overall area, making the most of the space available and making sure that there was optimum parking. The beds were given a generous curve, with neat curbed edges to contain all the planting and stop the issue caused by overgrown shrubs as before. More easily controlled planting gave interest and height. The use of a textured, riven paving would add safety and practicality to the project in all seasons. Elemental Paviors were chosen due to their stunning colour and texture. They’re a natural stone block paving that have been meticulously cut from a durable dolomitic limestone. They come in a range of mid-grey to charcoal colour shades and have a lightly riven and tumbled texture. The use of a natural stone add a feel of quality and robust longevity, while the ability to match kerb features enabled a seamless finish at the edges. 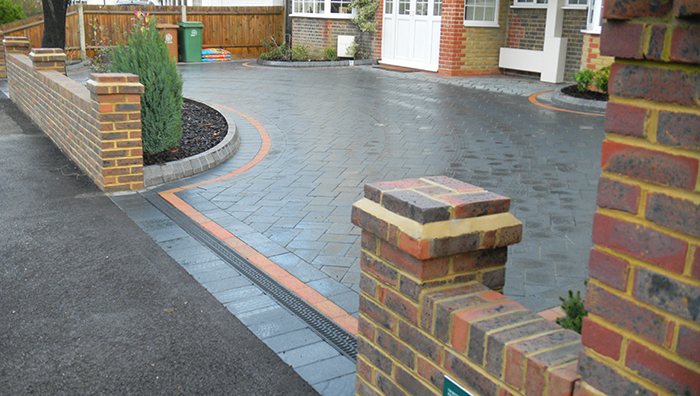 The use of Trident kerbs has given the edges a more defined look and serves to keep detritus from the driveway. The new design and installation has transformed the driveway from a tired and impractical area to a convenient and more manageable driveway. The use of Elemental Paviors has given the drive a new look, one that is more in keeping with the rest of the property. The overgrown planting has been cut back and the use of Trident kerbs has helped keep the beds under control. The new planting has created more space and a little more interest – giving the driveway more of a garden feel. The customers were thrilled with the results, especially how the design blends with the property and provides an excellent first impression. Award- winning Darren Plumridge Professional Driveway & Patio Construction was established in 1984 and delivers projects all over the South East and beyond. They employ a team of eight staff who carry out all work from concept to completion, from excavation to building ornamental and structural retaining walls.